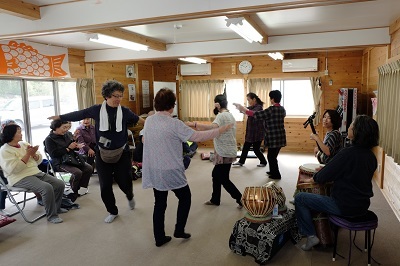 Of those victims that were driven out of their homes by the March 2011 earthquake and tsunami, many of those who came from areas not much affected by the Fukushima Daiichi meltdown are leaving their temporary housing to settle again in their hometowns or in new places. Those from areas badly affected by the meltdown, however, still have nowhere to go. They have no choice but to keep living at their temporary houses, after more than four years since the earthquake. As time goes by, their anxieties over their future are worsening, while the poor quality of their temporary housing is causing considerable psychological stress for them. We see unwanted conflicts between such evacuees and their neighbors. 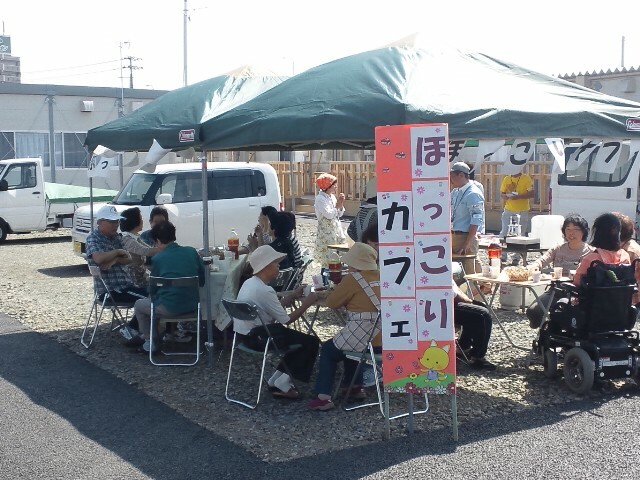 Confronted with this situation, the Project on Nuclear Power and Radiation is carrying out many support programs in order to “walk together” with those living in temporary housing. ▼Click each image to enlarge it and read the caption. 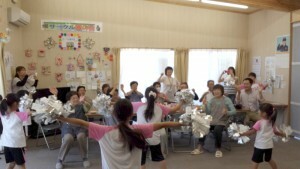 “Hokkori Café” is a place where evacuees can meet new friends and strengthen the friendships they already have. 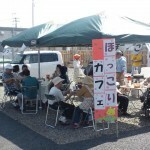 “Today, we held a temporary outdoor café in the parking area of the temporary housing. Named ‘Hokkori (Comfy) Café,’ it serves sweets, coffee, tea, etc., as well as provides a place where people can enjoy chatting with each other. “Children of ‘The Claps,’ a cheerleading team of kindergarteners and elementary kids, came to our Hokkori Café. 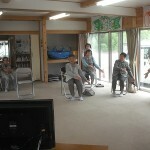 They performed some dance routines to cheer up our spirits. The audience kept on applauding their performances. 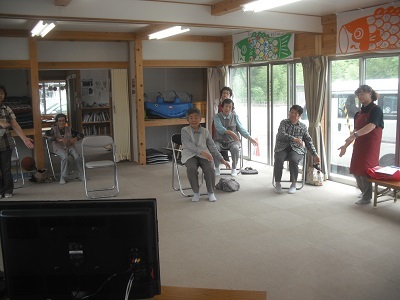 Exercising to a tune of traditional Japanese falk song. 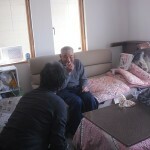 Home visit-maintaining a close relationship with people. 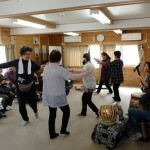 A live performance of traditional Japanese folk songs and guitar. 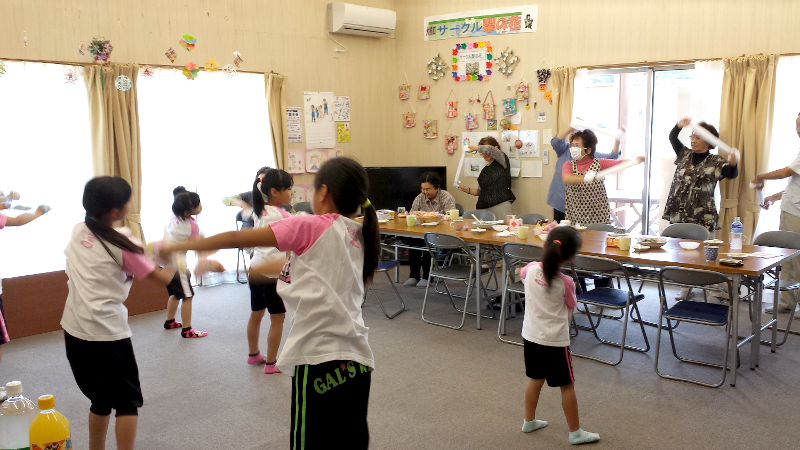 Since July of this year, Support Center Shinchi-Gangoya has been holding a “Wednesday Café” twice each month or so. 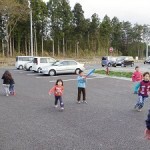 The café features “Hotto Corner ♡ Time for Parents and Kids” (time for parents and their kids to relax). Two medical doctors take turns attending the Café to talk about many things and provide consultations. The two are Dr. Keiko (Dr. Keiko Kitagawa), a psychiatrist and pediatrician, and Dr. Kako-chan (Dr. Kazuko Meijo), a pediatrician. We are Now in year 5 since the March 2011 disaster. Many victims are finding new places to settle down and leaving their temporary housing. 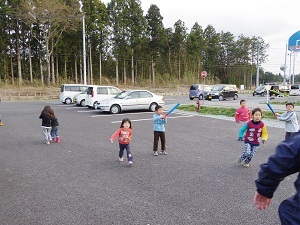 At the same time, some 70% of those still living in temporary housing are evacuees from areas affected by the Fukushima Daiichi meltdown. Such residents suffer greatly from a sense of disconnectedness and, as time goes by, they need more mental care. Soon after the disaster, Dr. Keiko visited Minamisoma City, Fukushima, as part of a medical rescue team. She has long been a participant at our Wednesday Café, listening wisely to the temporary housing residents as they described their sufferings. Dr. Kako-chan, meanwhile, is practicing in Tokyo. 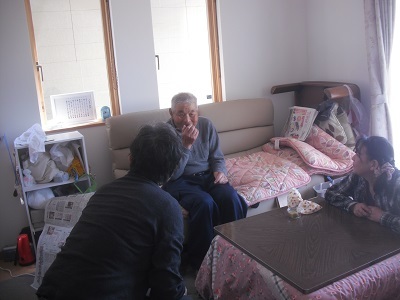 When she visits her parents in Sendai, she visits the Gangoya temporary housing on her way. She joins in our programs for kids, for instance, helping them with their summer holiday homework from school. Through working with kids this way, the doctor gets acquainted with their moms and then takes care of those moms’ psychological issues as well. Those that have taken part in our Café are quite appreciative of it, saying, “I am happy the doctor listened to me,” or “I’ll let my friends, also moms, know of this Café,” and other similar things.